GONE, NOT FORGOTTEN. 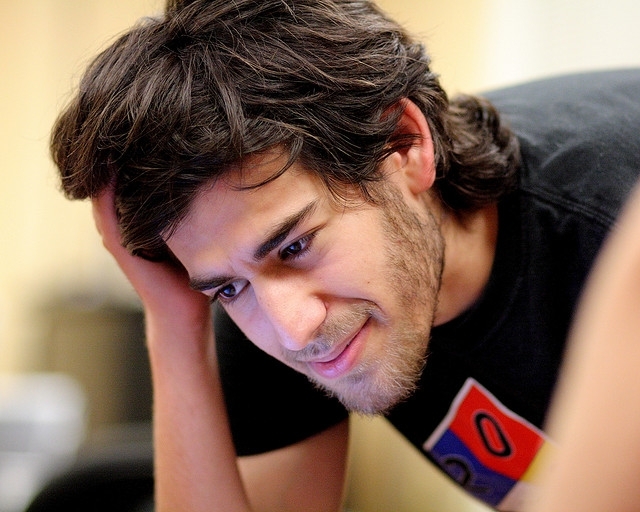 Chicago native and Internet activist Aaron Swartz, who committed suicide early this year as he faced prosecution for the theft from MIT of millions of online documents, will be honored Friday with the James Madison Freedom of Information Award. * From January: WBEZ&apos;s Robin Amer wrote after Swartz&apos; funeral, "I am drained from crying." REMEMBER ALL THOSE PROTESTS EARLIER THIS WEEK ABOUT HIGHER FEES IN THE CTA&apos;s NEW FARE SYSTEM? The CTA board has approved the plan anyway even though some board members themselves seemed not to understand it. So your existing Chicago Card is headed toward the scrap heap. But you might be able to get one of the new Ventra cards free. * CTA prices headed up for college students, tourists. * CTA train line colors added to Google&apos;s Chicago maps. * Mayor Emanuel proposes overhauling parking taxes to lower rates on cheaper spots, raise them on premium spaces. New WBEZ Meyerson News Quiz tomorrow. Catch up on last week&apos;s and other previous quizzes here. CLINTON-OBAMA TICKET? Speculation for the 2016 presidential race: Hillary + Michelle. * Mother Jones: "Turns Out That [President] Obama Doesn&apos;t Hate Whitey After All." * Bipartisan budget bill would make permanent four longstanding gun protections. ON TWITTER, NEW POPE&apos;S NO OBAMA. No matter how many tweets you read yesterday about the new pope, they weren&apos;t enough to break the record 20 million sent the night President Obama won reelection. * Twitter&apos;s next frontier? Music -- with an emphasis on sampling. * Google Reader, we hardly knew ye. And that was the problem. Or did Twitter kill it? * Gawker: "If You Wear Google’s New Glasses You Are An A__hole." * Is The New York Times technophobic? &apos;WERE YOU STRAPPED INTO YOUR CAR SEAT AND FORCED TO LISTEN TO NPR IN THE &apos;80s AND &apos;90s?&apos; That&apos;s the hook NPR&apos;s using to promote itself at the South by Southwest conference in Austin, Texas, courting loyalty among a demographic it calls "Generation Listen." * Meanwhile, WBEZ, which has been encouraging those former "backseat babies" to "Go Make Babies" of their own, is planning a "Member Meet-up: &apos;90s Time Machine Edition."